So, you decided to tackle the tattoo. Wild methods, like string and paste from the handle, you, as a reasonable person, do not consider, and realize that you will need some minimum set of equipment and instruments. What should it be? This is asked by all novice tattoo artists at the dawn of their activities. Let’s try to help. The main tool of the tattoo master. Clippers are rotary and induction. The design of the rotary machine is simple to primitivism – an electric high-speed motor, and the simplest crank-and-rod mechanism that transforms the rotation of the motor rotor into a reciprocating motion of the needle. To work with such machines is simple, they are most effective at drawing a contour of a tattoo – they easily achieve high accuracy of drawing of a line of a tattoo. Due to the high speed of the needle movement, the level of painful sensations decreases, and literally after 15 minutes of work the client simply ceases to sense them. Additional advantages of rotary tattoo machines are relatively low weight, low vibration and noise. They are convenient to work for several hours in a row. Another advantage lies in the principle of the electric motor – the frequency of the operation of such a machine is easy to control by changing the voltage, and do it in a fairly large range. The disadvantages of rotary machines are also known. Often they are not as powerful as induction, and sometimes it takes a “passage” of one section of the picture twice. And the lower the voltage, the lower the frequency of needle movement – the less power. It is not always effective to use such machines for coloring. However, modern models cope with this task. 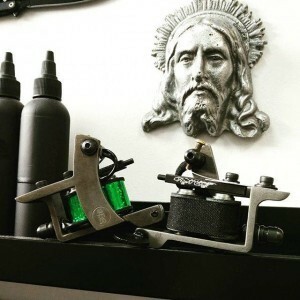 Induction tattoo machine is, in a way, a “classic of the genre.” One or two coils form an electromagnet that attracts an anchor plastic anchored on the spring. The needle is connected directly with the anchor. The machine is equipped with an adjustable contact pair, on whose settings the operating mode of the machine depends. Depending on the design and settings, induction machines are divided into Linear (for lines) and Shader (machine for painting, “work on areas”). There is a desire for universalization – but it is better for a master to have these machines separately. The only minus of induction machines is a sufficiently strong vibration, in comparison with rotary ones. Here the master will discover boundless possibilities for perfection. The detail, the purpose of which is clear from the title – for her holding a tattoo machine, and also inserting a bar for the needle. To the back of the holder is a tattoo machine, a tip is inserted into the front. When the machine is turned on, the needle starts to move in the holder, flying out of the tip, and returning to it – this is how the tattoo pattern is applied. Another name for the holder is the flu. In general, holders are divided into disposable and reusable. Metal reusable holders for needles are made of various alloys. A special coating makes it easy to clean and repeatedly autoclave (disinfect) these elements of tattoo machines. The diameter of most handles is in the range of 13 to 39 mm. The weight of the holder depends on the material from which it is made: steel, aluminum, various alloys. Metal reusable holders are good for their durability, however it turns into certain disadvantages. Reusable holders must be washed, cleaned and disinfected. They do not extinguish vibration – so you will need a bandage bandage. Plastic and nylon holders – disposable, sterile, supplied in sealed packaging. Reuse is prohibited – therefore, plastic holders are more practical and safer. Typically, the handle of disposable holders is made of a soft material – usually rubber. Such holder perfectly extinguishes the vibration of the tattoo of the machine, makes the work of the master more comfortable, prevents the deformation of the joints and other occupational diseases. There is a one-time holders and a drawback. Like any one-time tools, they need to be available with a certain margin, which still has the property of ending at the most inopportune moment. A separate view of the holders is modular. These holders are designed for the use of disposable Cheyenne needle modules and their analogs. The use of such holders allows the use of needle cartridges on any tattoo machine, which allows you to get rid of the tip as a separate part, greatly simplifies the assembly and adjustment, and qualitatively increases gi. It must be remembered that the holder is an anatomical thing, it is for her that the tattoo master keeps in the course of her work. Which one is better and more convenient is determined only by you, and by an exceptionally experienced way. Tipsy, spouts, watering cans – all these are feather-shaped tips, inside of which the needle moves when drawing a tattoo. The main difference between the tips is the shape of the needle outlet. It is clear that the shape and size of the hole must coincide with the shape and size of the needle – only in this case the needle will move strictly rectilinearly, and not to damage the pattern by transverse vibrations. Like the holders, the tips are disposable and reusable – they are made, respectively, of plastic or steel. Steel tips are designed for long-term use – the needle is unlikely to “break” guiding its “nose”, and the tip itself can withstand multiple sterilization. They are delivered as one by one, and by sets. Plastic nozzles – disposable, sterile, are supplied in individual packages-blisters. They do not need to be cleaned and sterilized – however, you always need to have a certain stock. The choice of the tip, like the choice of the tattoo holder, is a matter of individual preferences. Masters are advised to have both types – regularly sterilizable reusable and disposable. Over time, you will determine which tips and holders you are more comfortable working with. The main consumable material of the tattoo master. It is their quality that determines what will be the result of all efforts to stuff the tattoo. The needle repeatedly pierces the upper layer of the skin, and injects the pigment. Needles for tattoos have different sharpening and different diameters. Sharpening of needles is of three types: long, medium and short. Sharpening is determined by the length of the “cone” of the needle. Their diameter varies from 0.25 to 0.4 mm. Needles with a long sharpening are suitable for drawing a contour, the average grinding is considered universal, a short one is for shading. Needles of maximum diameter and with a short sharpening leave a thick point on the skin. Thin needles with a long sharpening, respectively, leave the smallest point in the skin. Soldered in bundles, elements of different diameters and with different sharpening form different types of needles – this determines their purpose. It would seem that a tattoo needle is an instrument that has been brought to perfection over many years of use, and it is impossible to invent it anew. Nevertheless, the company Cheyenne has succeeded – indeed, they have made a kind of revolution in the tattoo industry. The company proposed to combine in one cartridge a needle and a tip, creating a disposable module, besides protecting other components of the machine from getting liquids by a special membrane. This invention has changed a lot. The holder has changed – from the tube to the handle it has become a lock of the module and a guide for the pusher. The assembly of the tattoo machine has become much easier, there is a real opportunity to easily change the needles in the process. The process of applying tattoos has become much more hygienic. The drawing of the tattoo was much more accurate, since the needle and the cartridge body are optimally adjusted to each other in size. But the main thing, without which this system would not take root – the proposed approach was much more convenient than the classical scheme. Additional element of the bundle “needle – tip – tube holder – holder”. Used to fix the horizontal stroke of the needle, reduces needle swings to the sides. It is necessary not only for more comfortable work, but also for better drawing of the picture. In general, when assembling a tattoo machine, a sufficiently large number of various rubber products can be used. It would be superfluous to read the instruction, to listen to the advice of experienced colleagues. The task of the power unit is to convert the mains voltage into a current with characteristics suitable for the operation of your tattoo machine. A suitable, and most importantly, a high-quality power unit is the guarantee of the health of your tattoo machine. Blocks are of two types – impulse and transformer. Pulse blocks are more compact, and modern technologies for the production of components have made them even more reliable. Typically, a switching power supply provides a current of 2 A, which is suitable for most tattoo machines. Transformer power supply is bigger and heavier – it’s rather a stationary option for a tattoo parlor. Such a power supply unit can “give out” a current of 3 A or more – it all depends on the characteristics of the particular model and your needs. The minus of such units – transformers badly refer to the “jumping” load, characteristic for tattoo work. Regardless of the type of unit, it must have a voltage regulator, ideally an output voltage indicator, and various protections – from overheating or overload, as well as short circuits. The main requirement for the unit is a minimum “drawdown” of the voltage when the load is connected – this makes the machine work more predictable and easily configurable. It should be remembered that for powerful machines you need a powerful unit, as well as high-quality cords with good throughput. So, if your machine has stopped “buzzing”, do not panic. It is better to first find out what the problem is. Maybe your unit just does not have the strength, or the wires are damaged somewhere.